My favourite bread in the whole world, in fact, and yes, I’ll happily employ superlatives when describing the sourdough from Calgary’s Sidewalk Citizen Bakery. These crusty, golden loaves are the work of Aviv Fried, a dear friend of mine who I first met while working at Janice Beaton Fine Cheese. Aviv has a story that writers love to tell, and I’m no different. He and his partner Michal Lavi (a phenomenal filmmaker – you can find info about her latest film here) moved from Israel to Calgary over a decade ago. They came to study, and after completing his undergraduate degree in physics, Aviv continued on to a masters in biomedical engineering. Needless to say, he’s more into science than I am. With graduation nearing and a banking job all lined up in Toronto, Aviv decided he’d rather play with flour than finances, so they stayed in Calgary. He got a job managing the cheese shop, and began teaching himself the art of sourdough. It truly is an art; transforming flour, water, and salt into loaves of sour/chewy/crusty goodness isn’t easy, especially when you’re working with a temperamental oven in a tiny apartment. He came up with a system to deal with the excess loaves that resulted from his bread experiments: on Saturdays he’d start the bread making process, Sundays he’d make the dough, on Mondays he’d bake the bread, hop on his bike, and distribute sourdough all over the city. To cover the costs of the organic flour he baked with, he charged $6 per loaf, and donated any leftover funds to a library charity in Malawi. Aviv often brought his loaves into the cheese shop, slicing through their chalky crusts to show us what had worked that week, and what aspects he wanted to improve. It was a slow process, one that required a great deal of patience and intelligence, and I watched as his breads transformed from ‘good for an amateur’ to what is surely some of the best sourdough I’ll ever taste. 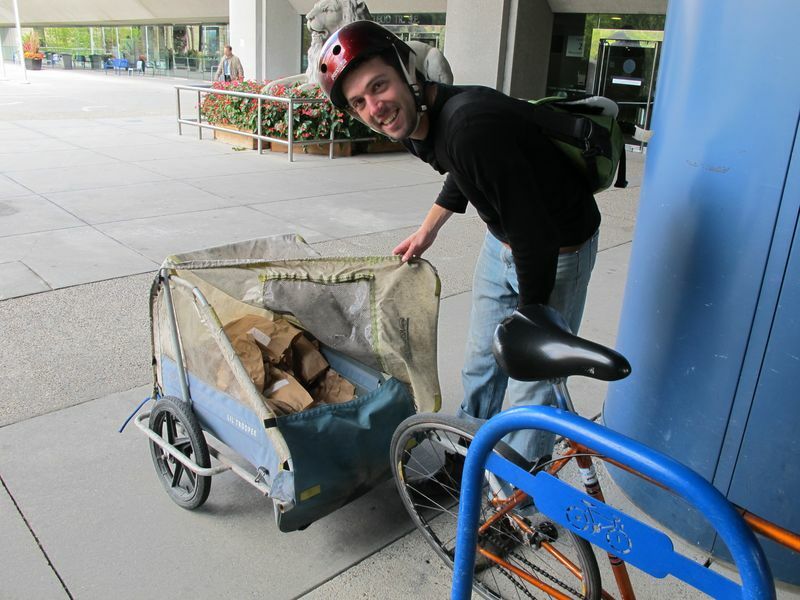 Once the demand for his bread outgrew his bike trailer, Aviv expanded by renting his own kitchen near Chinook Centre, importing a beastly European bread oven, and taking on bread full-time. I was his first employee, helping out for three months after I came back from doing my masters degree. We listened to CBC all day while Aviv made dough, shaped loaves, and baked bread, and I helped out with scones, deliveries, hand-rolling the croissant dough, and making lunch. Michal, Aviv, and I ate many a roasted chicken, and laughed a lot. It was such a tiny operation then, I barely recognized the place when Dana and I walked into the bakery this summer. In just a year and a half, Sidewalk Citizen has grown from 1 employee to 24, increased its production by about 1000, opened a second location in Sunnyside Market (Sidewalk Citizen Delicatessen), and will be opening a third shop in the Simmons Building within the next few years. If I hadn’t been afraid of looking like an idiot in front of all their staff, I would have wept with pride. Instead, I beamed and shoved croissants after croissant into my mouth. So what is Sidewalk Citizen all about? It’s about creating extraordinary food that has a place within the community. The name comes from Jane Jacobs' book “The Importance of Death and Life of Great American Cities,” and refers to a citizen’s place within a city, and their participation in the ‘sidewalk ballet,’ the continually changing scenes that unfold between the street and buildings. Aviv uses locally-grown organic flour (including Red Fife and flour from Highwood Crossing) to make his hearty French sourdoughs, with the flavours of Israel (think tahini, sumac, and nigella seeds) influencing much of the delicatessen’s pastry and savoury foods. We ate plenty of bread, sandwiches, pizza, salads, and of course, SWEETS. You must eat as many croissants, cheese sticks, dark chocolate brownies, scones, brioche cinnamon buns, rosemary polenta poundcakes, and danishes as humanly possible while there. You simply must. After all, what could be more Canadian than French sourdough made with Canadian flour and served by Israeli immigrants? This, this is Canadian food. "Under the seeming disorder of the old city, wherever the old city is working successfully, is a marvelous order for maintaining the safety of the streets and the freedom of the city. It is a complex order. Its essence is intricacy of sidewalk use, bringing with it a constant succession of eyes. This order is all composed of movement and change, and although it is life, not art, we may fancifully call it the art form of the city and liken it to the dance — not to a simple-minded precision dance with everyone kicking up at the same time, twirling in unison and bowing off en masse, but to an intricate ballet in which the individual dancers and ensembles all have distinctive parts which miraculously reinforce each other and compose an orderly whole. The ballet of the good city sidewalk never repeats itself from place to place, and in any once place is always replete with new improvisations."